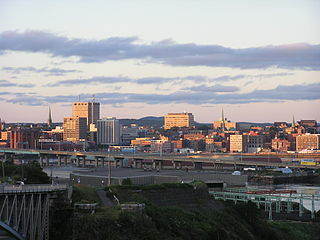 Saint John is situated along the north shore of the Bay of Fundy at the mouth of the Saint John River. 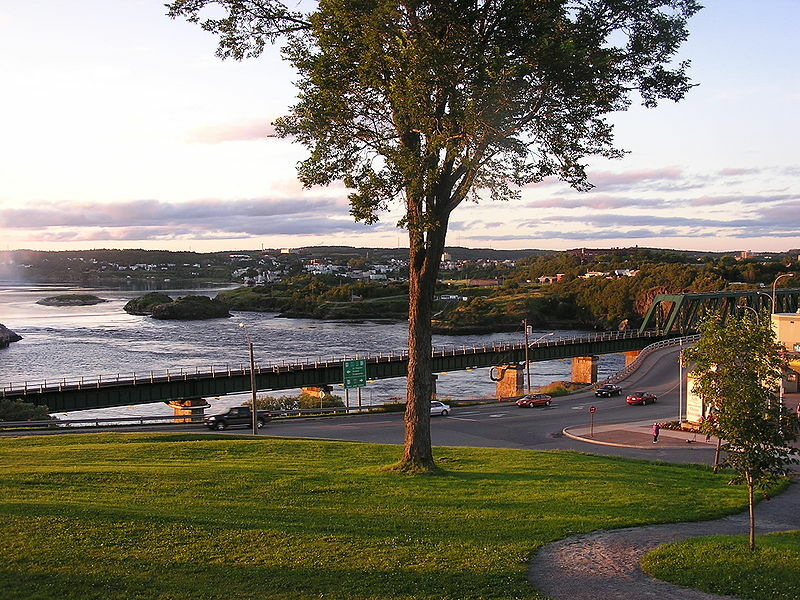 The city is split by the south-flowing river and the east side is bordered on the north by the Kennebecasis River where it meets the St. John River at Grand Bay. The St. John River itself flows into the Bay of Fundy through a narrow gorge several hundred feet wide at the center of the city. It contains a unique phenomenon called the Reversing Falls where the diurnal tides of the bay reverse the water flow of the river for several kilometers. A series of underwater ledges at the narrowest point of this gorge also create a series of rapids. Within the Uptown it is possible to travel on foot between the City Market, Brunswick Square Mall, Market Square, the Canada Games Aquatic Centre, Mercantile Centre and Harbour Station via underground and pedway connections without venturing outside. During the summer months, Uptown Saint John also offers a very pleasant and fairly accessible walking experience, with clear, well-maintained sidewalks and crosswalks, and fairly straightforward navigation. The Uptown is home to hundreds of privately owned and operated shops that sell a wide variety of food and merchandise. A stroll down King Street will offer stores selling local arts and crafts, while across the street the Brunswick Square Mall offers more commercial stores for your shopping pleasure (clothes, shoes, cards, books, music, Laura Secord Chocolates, etc.) Try Germain and Canterbury Street (both off King Street) for used books, international cuisine and independent record stores. Local businesses, craft workers, artists, farmers, bakers and grocers sell a wide array of unique foods and crafts, native both to New Brunswick and around the world. It is the oldest operating farmers market in Canada and home to fresh fruits and vegetables, fresh from the sea seafood, and Java Moose, a locally owned and operated coffee house. The City Market building is a historic site with amazing period architecture. Entrances to the market are found on Charlotte and Germain Street in the Uptown. 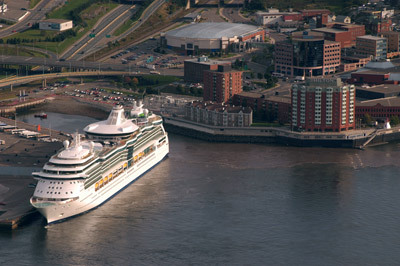 Saint John is a historical city with a popular cruise ship terminal in the uptown area. The city is one of the busiest shipping ports in Canada in terms of gross tonnage. Saint John has become a major energy hub for the East Coast. Saint John (French: Ville de Saint John) is the largest city in the province of New Brunswick, and the first incorporated city in Canada. Since the Irish Famine, Saint John developed into a transition from mainly a British Loyalist city to an Irish, city. It is said to be the most Irish city in Canada. Marco Polo Cruise Terminal, on the renovated Saint John waterfront blends with the nineteenth-century architecture of the historic port city, which surrounds it. The building resides alongside the award winning pedestrian trail named Harbour Passage and is also the new home of the Saint John Port Authority Executive offices. A secondary cruise terminal is located on Long Wharf. Late spring and early fall temperatures average in the 60's during the day, and 40's overnight. High temperatures during the summer months of July and August average in the low 70's during the day and mid 50's overnight. 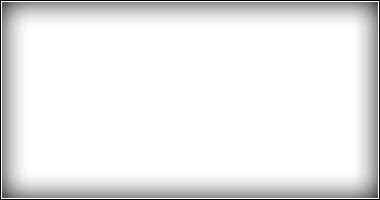 Saint John experiences a considerable amount of fog during the summer months, though the fog usually does not last throughout the entire day. Located in Market Square in the city's Uptown. The museum boasts a wide array of local historic information and artifacts, artwork, scientific exhibits and displays, and a Discovery Centre with many interactive and educational activities. Museum has a to scale plaster of a mastadon skeleton and skeletons of whales. Located on the West Side, admission is also free. A variety of walking trails lead travellers through woods, guide them into marshes, and bring them to beaches and lookout points on the sea. Located in the city's North End, Fort Howe offers a panoramic view of the city and harbour as well as being a historic attraction. As the Saint John River flows into the Bay of Fundy, whose tides are the highest in the world, strong rapids form as the tide rises and clashes with the flow of the river below the Reversing Falls bridge. During the summer months a Jet Boat offers tourists the thrill of tackling the rapids up close. A pulp and paper mill is located in the area near the bridge. In the heart of the Uptown, King Square is home to gardens, monuments, and the trademark Bandstand / Fountain at its center. Adjacent to King Square is the Loyalist City Burial Ground, whose cobblestone paths lead past graves over two centuries old.